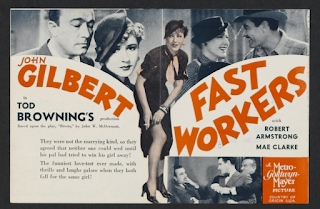 This year the Warner Archives released FAST WORKERS on DVD-R. A 1933 melodrama made by MGM, the movie's main claim to fame is that it was directed by Tod Browning. Browning is of course known for films such as the Bela Lugosi version of DRACULA, FREAKS, and many collaborations with Lon Chaney. There is not much written about FAST WORKERS, even in volumes dedicated to Browning's work. It is not a horror film, but it does have two stars who were genre legends: Robert Armstrong from KING KONG and Mae Clarke from FRANKENSTEIN. One would think that having those two in a film directed by Tod Browning would give FAST WORKERS more of a reputation. The film's story concerns skyscraper construction workers Gunner (John Gilbert) and Bucker (Armstrong). The rougish Gunner and the naive nice chump Bucker are best friends who have a interesting way of "protecting" one another--they both make sure the other never becomes a sap and gets married. Gunner's way of showing respect for his friend is by humiliating him. Gunner is one of those smart-alec guys that the audience is supposed to be charmed by, but Gilbert just comes off as a jerk. If James Cagney or Clark Gable had played this role, it might have worked. Armstrong fares a lot better in his part. The well-meaning Bucker winds up getting hoodwinked by grifter Mary (Clarke), who already has a relationship with Gunner. Mae Clarke is the real star of this movie. Her conniving Mary is a far cry from Clarke's prim Elizabeth in FRANKENSTEIN and her brittle Myra in WATERLOO BRIDGE. Sporting a chic hairstyle and a smart wardrobe, Mary is more than a match for both Gunner and Bucker. It would seem that FAST WORKERS has nothing to do with the rest of Browning's film work. This film features high-rise building workers instead of Browning's usual collection of circus performers or criminal gangs. There are some similarities though. Just like the carnies and the crooks, the laborers are a band of eccentric individuals who specialize in unusual, high-risk occupations. Browning shows that Gunner, Bucker, and their co-workers have their own type of "code" and way of living, just like the groups in the circus or the criminal world. There really isn't any "horror" moments in the film (unless you count the scene where one of the cast almost falls to his death). There IS a scene worthy of the macabre side of Browning. It's where Bucker sits at his kitchen table the morning after realizing he's been made a fool of by Gunner and Mary. He has no dialogue--Browning just shows a number of tight close-ups of Robert Armstrong's face, and we know that this worm is going to turn. Armstrong, in this scene, even kind of reminds you of....Lon Chaney. FAST WORKERS isn't a great film, or even a great pre-code film. But it is of interest because of the cast and the director involved. Any one who is interested in the work of Tod Browning should see what is considered to be one of his few "normal" films.